The Amrita Santhulam (Balance trainer), is a low cost rehabilitation system for the elderly patients suffering from stroke, Parkinson’s, peripheral neuropathy, diabetes, post ankle sprain and similar morbidities which cause impaired static and dynamic balance in the human body. This was launched on the occasion of Amma’s 61st birthday celebrations, developed by Ammachi Labs of Amrita University and the Physical Medicine & Rehabilitation Dept at Amrita Hospital. Thiruvanchoor Radhakrishnan, Minister of Forest, Transport & Environment unveiled this equipment. The balance training system will motivate the patients to perform repetitive rehabilitation exercises through games offering the functionality to simulate real world scenarios. The system provides audio and visual feedback to the patients balance while performing an activity like brushing their teeth or fastening a button. This is an innovative approach in addressing the patient’s ailment. Doctors can analysis their patient’s therapy progress with immediate feedback. An advanced balance analyzer software program running in the background provides the doctor/therapist with information on the patient’s progress of therapy in a qualitative fashion. 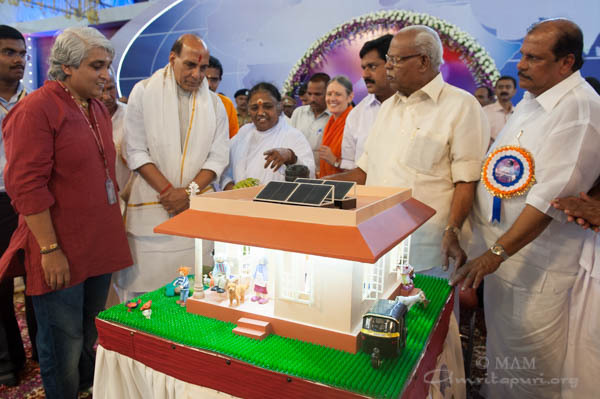 Amrita Centre for Nanosciences introduced Amritadyuti, the Solar Home-Lighting System during Amma’s 61st birthday celebrations. This low-costs system consists of three LED lights, a radio and a mobile-charger powered from a solar-power system. It has been designed as a package for Amrita Kuteeram homes and village hamlets (of 101 villages of Amrita SeRVe) so as to ensure them power even if they are cut off from the main power grid. C.N. Balakrishnan, Minister of Co-Operation unveiled Amritadyuti. The Minister also unveiled Amrita Karshakan, a solution for farmers facing serious financial problems with regard to receiving fair compensation for their produce. It enables farmers to trade using SMS, Web and mobile platform as well as kiosks. The system also helps beneficiaries getting locally grown produce at a fair price in an efficient way. This will be a major contribution in Amrita SeRVE’s 101 Villages project. 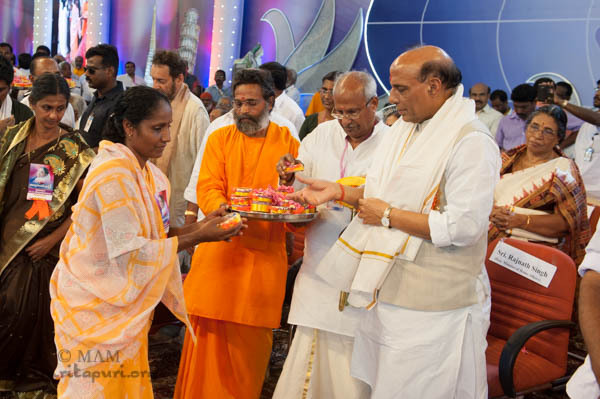 As part of Amma’s dream that everyone in the world should have a solid roof over their head, the Mata Amritanandamayi Math has constructed more than 45,000 homes for the homeless in more than 75 locations across India since 1998. Often, in response to floods, earthquakes and other natural disasters, entire villages are reconstructed at a time. 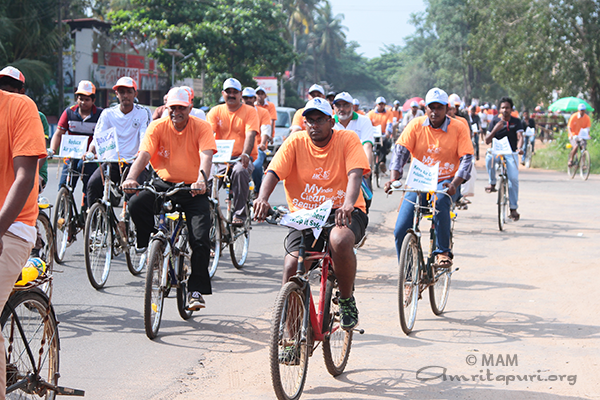 This year, the Math has constructed 500 houses in various locations in Kerala. And, in Uttarakhand, where the Math launched an Rs. 50-crore relief-and-rehabilitation package for flooding victims in 2013, the Math is constructing 250 houses. Sri. Rajnath Singh, the Hon. 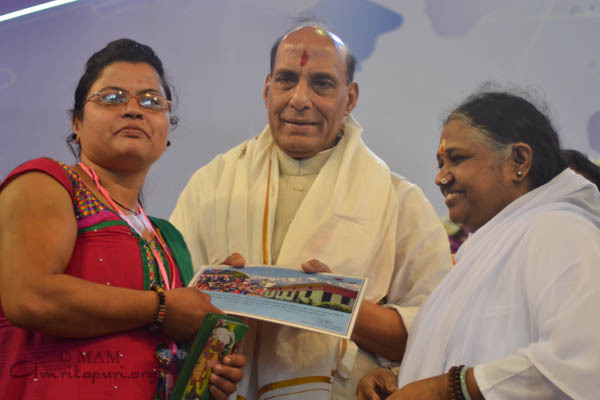 Union Minister for Home Affairs bestows keys and certificates to beneficiaries of this project, some of whom have come all the way from Uttarakhand. Sri. 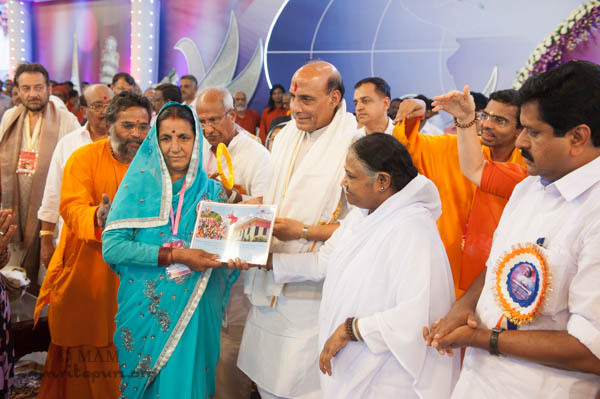 Rajnath Singh, Union Minister for Home Affairs officially launched the Mata Amritanandamayi Math’s Rs. 25 Crore Relief & Rehabilitation Package for Jammu-Kashmir, as part of which houses MAM construct houses for people who have lost their homes in the flooding. 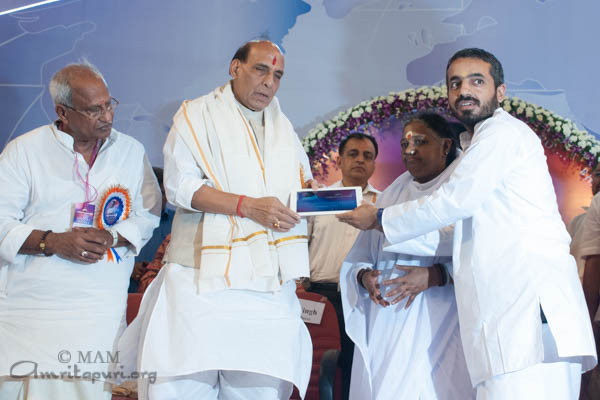 The Amrita Sphuranam project of Amrita Centre for Wireless Networks and Applications, the Mata Amritanandamayi Math will be providing solar-powered electrification for the entire rural village of Motakkara in Wayanad. 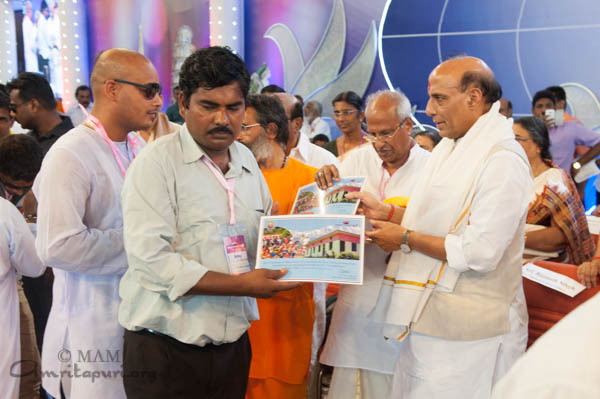 Amrita Sphuranam was created as part of Amrita University’s Live-in-Labs Program and the Mata Amritanandamayi Math’s Amrita SeRVE initiative to make 101 villages in India totally self-reliant. 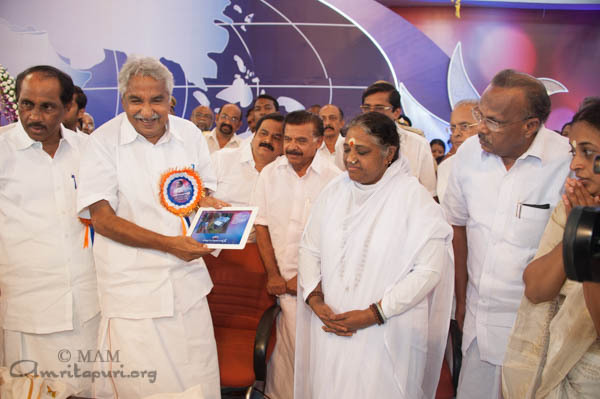 Kerala Chief Minister Shri Oommen Chandy launched the solar electrification project “Amrita Sphuranam” on the occasion of Amritavarsham 61 at Amritapuri on Saturday. Addressing the gathering, Kerala Chief Minister Oommen Chandy said “Amma is a strength to the society and her birthday celebrations serve to spread the message of goodness and peace to the world”. 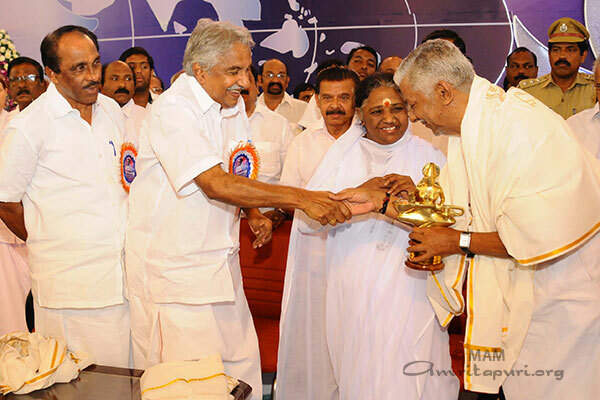 Kerala Chief Minister Oommen Chandy presenting Amritakeerti Puraskar to devotional poet S Rameshan Nair in the presence of Mata Amritanandamayi Devi on the occasion of Amritavarsham 61. S. Ramesan Nair is a devotional poet, playwright, lyricist and as a translator and commentator upon classical Indian literature such as the Tamil works Chalappathikaram and Thirukkural. The Amritakeerti Puraskar comes with a cash prize of Rs. 1,23,456, a statuette of Saraswati Devi and a citation. We are living in a world where various individuals, societies, caste communities, religious groups and countries are segregating themselves from each other. For their own happiness and pleasure, they are competing to make each other cry. It’s startling when we realize that the world we are living in today is one wherein even elderly women with one foot in the grave are not spared from cruelty and abuse. There are groups preaching a form of terrorism even more savage than that of primitives. They stand ready, aiming to make human life completely miserable.Therefore, in today’s world, there are no guarantees. Anything can happen to anyone, at any time, at any place. At present, the human race is caught in the midst of many serious problems: global warming and other natural disasters, unemployment and economic recession. Many countries are trapped in the grip of poverty and famine. New infectious diseases are arising; infant mortality is increasing. There are more incidents of suicide and psychological problems. These days, for the sake of money, people are ready to do even the cruelest things. For many, amassing money by any means, satiating themselves with liquor, and delighting in the pleasures of the senses without any discernment are the very goals of life. Our youth are leading lives devoid of any fundamental human values. Our family lives and the relationships between husbands and wives, etc, are becoming a mockery. We see mothers and fathers completely unable to discipline their children, and children totally forgetting their dharma to their parents. If we don’t awaken and act now, there are grave dangers waiting for humankind. Currently we are acing as if we are in a hurry to embrace these dangers, rushing straight towards them. If you probe into the source of most of the problems in the world, you will find only one answer: lack of love and compassion. A lot of effort is being put forth to find a vaccine to stop the spread of the Ebola virus, which in some African countries has become like a nightmare, destroying thousands of lives. However, currently, a much more dangerous virus is at large—a virus that is devouring countless lives every day. This is the virus of hatred. We need not search far and wide to find a cure for this virus. The vaccine is readily available inside each and every one of us: love and compassion. Love and compassion not only provide us with strength and vitality, they also uplift everyone around us. Love is the divine medicine and compassion is the mrita-sanjeevani—the remedy for death. We very often hear people ask, sadly, “Why is our world in such a state? Why has our country declined in certain areas?” We are forgetting an important truth: The world includes us as well. Thus, we should see that we are also playing a role in making this world better or worse. Consequently, if we try, we can make this world a better place. One of the reasons for the current state of the world is that many people are ready to take whatever they can, even if it means harming others, but when it comes time to sacrifice for the general social good, they run away from their duties. One of ancient Bharat’s valuable contributions to the world was the invention of number zero, but now our country needs to add a few things to that zero: zero-poverty, zero-illiteracy, zero-waste, zero-crime, zero-violence against women, etc. If we can make strides in these areas, India can become a role model for many other countries. Thinking about the current state of Bharat, one of the things that comes to Amma’s mind is the increase in crimes against women. Statistics say that the incidents of these crimes have increased by 27 per cent in the past year. Some of us see these as “women’s issues,” but this is something of concern for the entire society. Why? Because women are the very foundation of society and the very foundation of the family. A nation can only truly be called advanced when the security and wellbeing of its women are ensured. Boys should be taught from a young age to respect and support girls. Along with this, women need to awaken and arise. This is the need of the hour. The time when woman were viewed as weak and helpless is over. The progress of the world rests in the rise of knowledgeable, self-confident, capable and compassionate women. Women have the power to create a new world now, while working side-by-side with men. Just as we hear of alcohol addiction and drug addiction, today there is also Internet addiction. Misuse of the Internet is one factor contributing to the increase in crime against women. No doubt, the Internet has caused a technological revolution in all spheres of life. We cannot discount all the achievements that have come through it. However, we shouldn’t turn a blind eye to the negative effects that have arisen from its misuse. So many relationships and lives have been destroyed due to this addiction. Another thing that we need to be aware of is the preservation and protection of Nature. 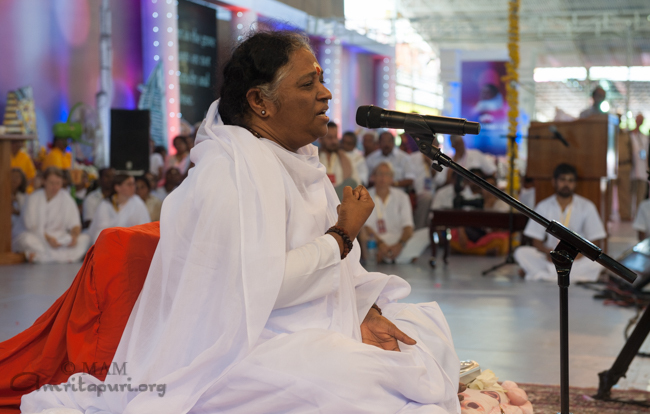 Natural disasters like the recent landslide in Maharashtra and the floods in Jammu-Kashmir are constantly haunting us. When these tragedies take place, it isn’t God that needs to be cross-examined in the witness box, but man. In reality, every natural disaster is a warning from Nature that we need to rectify our ways. We should not ignore these warnings. In today’s world, life has become very mechanical. Two people living under the same roof often live devoid of love and happiness, unable to understand or truly acknowledge the other. In the olden days, it was different. While there were no mobile phones back then, the communication that happened through love was perfect and transgressed all barriers of time and space. We need to enjoy every moment of our life, aware of how precious it is. Life does not become meaningful by chasing after sense pleasures like an animal. It only becomes meaningful when we spread happiness to others. It is this understanding that makes a human being truly human. No one knows how long he will live. Therefore, as soon as possible, we should complete all the good actions we are supposed to. Let’s not postpone anything for tomorrow. 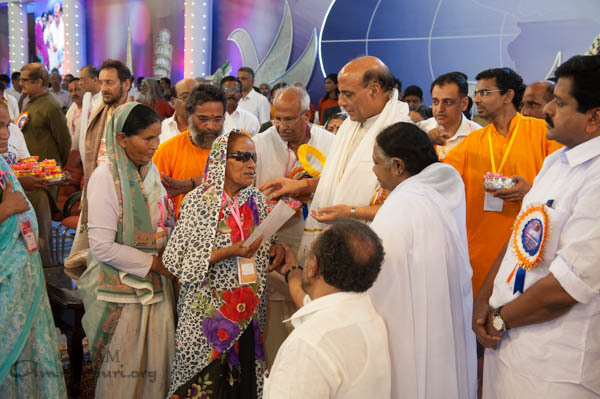 Devotion and compassion towards the poor and the needy go hand in hand. They are like two sides of a coin. We should look around us and reach out to people who need our help. If we are able to help even just one person, we can bring about a big change in their life. If my children can become ready to share their lives with the poor and the needy, that would be the best birthday present Amma could ever receive. 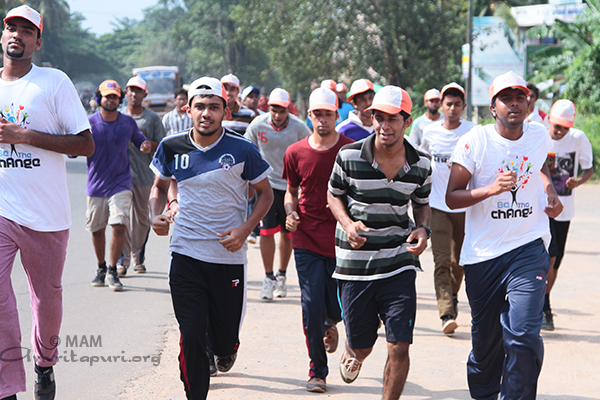 Amrita University observed ‘Car-Free Day’ on 22nd September 2014 at its Amritapuri Campus with a bicycle rally and a 10KM road run. 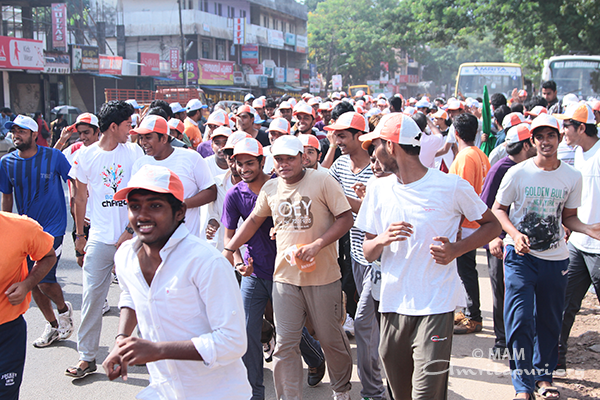 Over 800 students and 200 faculties volunteered, took leadership for the campaign which started at 8:30 a.m from Karunagappally to Amritapuri. The highlight of the day is that no one would come to the campus by private car or bike on that day. Day scholars shall avail of public transport facilities or use bicycles to reach the campus. The objective of the Campaign is to promote the use of public transportation, car sharing and emission–free vehicles as an effort to address the crisis of environmental pollution. 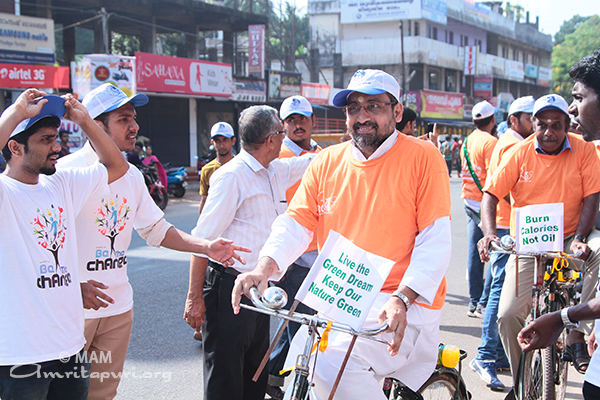 Contributing towards a ‘Greener Tomorrow’ is drawn inspiration from Amma’s words on our duties and responsibilities towards the protection and preservation of our Mother Nature. Amritapuri: This year’s Amrita Keerthi Puraskar will be bestowed upon renowned litterateur S. Ramesan Nair. 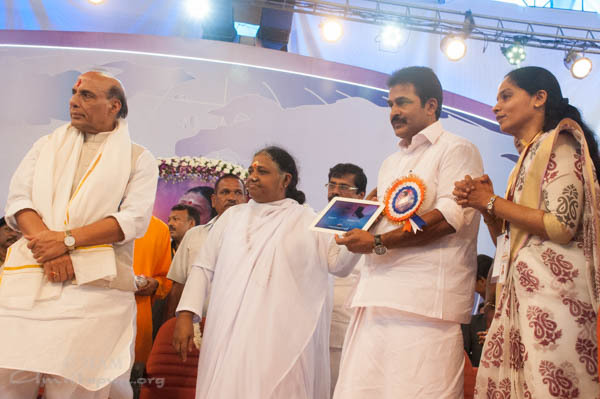 The award will be presented on September 27th, 2014, in Amritapuri, during Amma’s 61st Birthday Celebrations. The Amritakeerthi Puraskar is awarded annually since 2001 to eminent personalities for making outstanding contributions in the fields of spirituality, philosophy, culture and literature. The award comes with a cash prize of Rs. 1,23,456, a statuette of Saraswati Devi sculpted by the renowned sculptor, Artist Namboodiri and a citation. Ramesan Nair has made lifelong contribution to Indian culture through his poems, plays, lyrics, translations and commentaries. The Amritakeerthi Puraskar Committee cited his translations of and commentaries upon the Tamil classics Chilappathikaram and Tirukkaral, his compilation of poetry and commentary on Neetisaarangal. Sri. S. Ramesan Nair has received several literary awards in the past including the Poonthanam Award, Janmashtami Puraskaram, Revathy Pattathanam Puraskaram, Kerala Sahitya Academy Award, Sanjayan Puraskaram of Tapasya, Puthezhan Puraskaram, Edassery Puraskaram, Venmani Puraskaram and Ottur Puraskaram. He has also been recognized by the Government of Tamil Nadu for his many translations from Tamil to Malayalam.